High Quality Content by WIKIPEDIA articles! 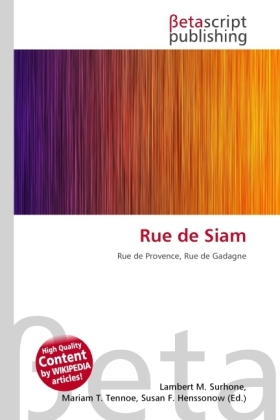 The rue de Siam or Siam Street is the main arterial street of Brest. Its name comes from the arrival of three ambassadors led by Kosa Pan, sent by the King of Siam on the 29th of June 1686 to meet Louis XIV in Versailles. They went with six mandarins, three translators, two secretaries and a retinue of servants, loaded with presents. They traveled on the boats l'Oiseau and la Maligne. They crossed Saint-Pierre Street to go to the hostel of the same name. The inhabitants were so amazed that they renamed the street. The street was quite narrow before World War II. The rue de Siam is quoted by Jacques Prévert in his poem Barbara. The rue de Siam is well known among sailors from all over the world. Those who call at Brest at least once, remember this short name, easy-minded, all their lives long. If you ply along African coasts, it is not rare to meet Bretons, harbour masters, local employees, sent far away from their native Brest, recalling the rue de Siam like others the Eiffel Tower or the Acropolis.